How can Nepal, which has enacted RTI Act, deny its citizens access to the office of their representatives? The ground floor of the Prime Minister’s Office (PMO) of Sweden is open to all Swedish citizens. There is a public library on the same floor, which people can visit and easily view records of PM office. People can get the attested copies of those records on demand. Documents are computerized and made accessible online. This model of dissemination of information has been replicated by all Scandinavian countries: their major government offices and central secretariats are accessible to the people. Needless to say, these offices also work for the people. In Nepal, people are not allowed to enter Singh Ddurbar, the central secretariat of the government, where all the ministries are located. They restrict the public from entering the compound, let alone reach the ministries. People are denied access to the secretariat of the sovereign parliament, which also lies there. 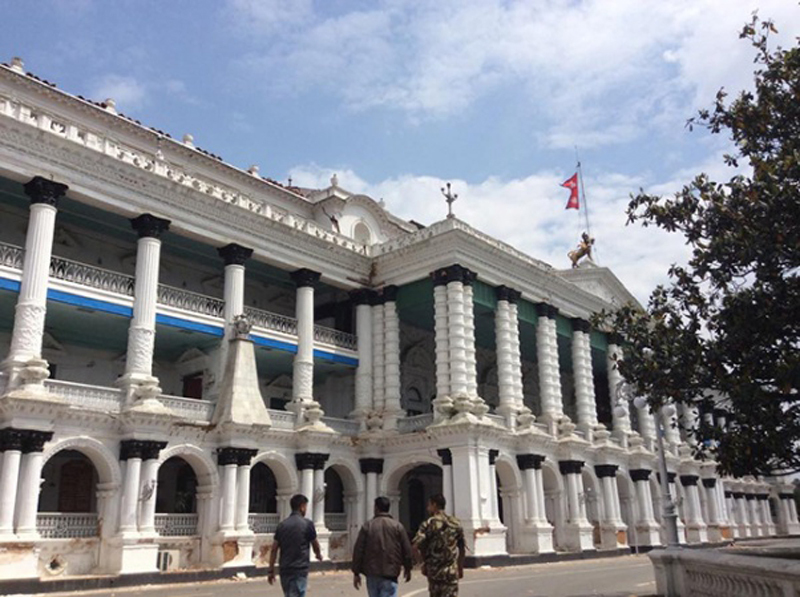 Those who do not have political reach or acquaintance with government employees inside Singha Durbar cannot meet their representatives, ministers and administrators. People are rather compelled to meet them at their residence. For the last six months, however, one “Open Singha Durbar” campaign has been gaining momentum. The campaign that had been launched via social networking sites has taken a legal form as well. Realizing the need of an approachable Singha Durbar, some people lodged an appeal at the National Information Commission (NIC) three months ago. The NIC then issued an order to the concerned offices to open the gate for the public. Singha Durbar, however, is defiant. Nepal entered the tenth year of implementation of Right to Information (RTI) Act on August 19. But there has not been a satisfactory progress, even though a few precedents have been established. The disclosure of duplicate VAT bill affair, the provision to present the bill voucher of all government expenses, the availability of answer sheets of the university exams and the marks of Public Service Commission exams to the examinees on demand are some notable achievements in RTI. But there has been no progress in securing the access to information of a broad section of the society. NIC leadership is more proactive in reaching out to public these days. Information campaign activities are also increasing in the country. There is no proper record to ascertain the exact demand for information made in these nine years since the Act’s implementation. The informal estimate is around 4,000. In India, more than 4.2 million people had demanded some kind of information in 2015 alone. More than 60 percent of the populations of the Scandinavian countries have at some point or the other exercised their right to information. Singha Durbar has closed itself, but we seem content to keep our queries to ourselves. We lack time and temperament to acquire the entry passes or to please the staffs inside in order to enter Singha Durbar. This also discourages us from seeking information from the offices inside. Our access to Singha Durbar is vital for other reasons as well. Every year, the National Information Commission submits its annual report to the prime minister, whereupon the report must be discussed in the parliament. But not a single report has been discussed till date. That these reports have not been forwarded to the parliament shows that our government officials are still not serious about RTI and that it’s not one of their priorities. Again, Singha Durbar is closed for the general public. How can a country that has enacted RTI Act deny its citizens access to the parliamentary secretariat, the office of their representatives and all central administrative offices? In a democracy, the parliament is as important and sensitive a body as the judiciary. How can people get their voice across to their representatives when the parliament secretariat is not accessible to them? How can they give feedback on the laws to be formulated? Suggestion boxes have been kept at each and every ministry, but how can citizens drop their suggestions when they cannot even get there? Public participation is a must for framing and implementing public policies. In fact, in a democracy, such policies are drafted in line with people’s feedback. In Nepal, however, the policy drafting body—the parliament and the central administrative authority—willfully prohibits the people from taking part in the vital policy-making debate. This is against the fundamental norms of democracy. Security concern is often cited as a reason for denying general people access to Singha Durbar. But security can be easily maintained by deputing more security personnel and by using metal detectors. Right To Information is not limited to acquiring a photocopy of vital information. Citizens must be able to visit the right place, and collect information first-hand on the workings of the government. This is why Singha Durbar must be open to all. People’s representatives and high-level administrators confined within the walls of Singha Durbar must realize that the bigger the lock at the gate, the more tyrannical the government is likely to be.